You certainly you might have tried or heard about sweet pastiera but today I would like to introduce my recipe for savory pastiera to you. The Neapolitan pastiera was originally a typical pie for the Easter Sunday in Campania, but nowadays it is prepared all year long. 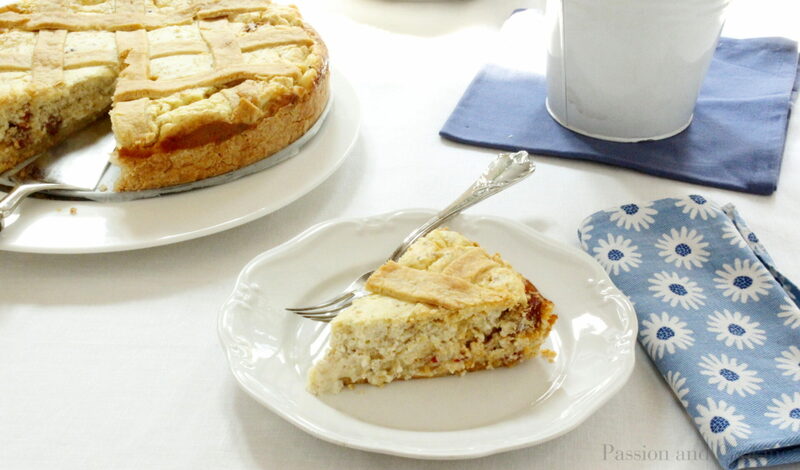 My savory pastiera is a delicious pie prepared with pasta frolla (Italian pie dough) filled with grano cotto (cooked wheat kernels), goat ricotta cheese, spicy salami, provolone cheese and eggs. A key ingredient is the grano cotto (see note for more information) a staple in the baking section of every Southern Italian grocery store, sometimes even labeled “per pastiera”. 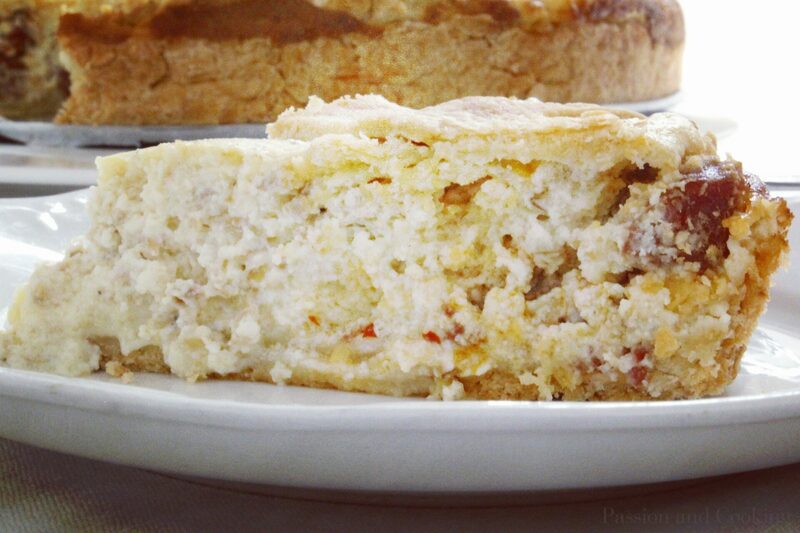 Another key ingredient is fresh goat ricotta that is more digestible than ricotta made from cow’s milk. I like it a lot for cooking as well as eating fresh with my salad. 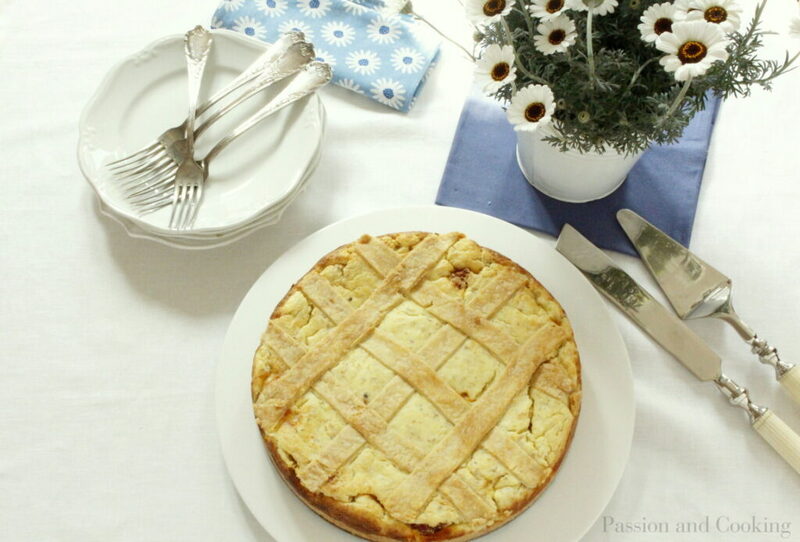 Tradition calls for the pastiera to be prepared on Thursday or Friday before Easter Sunday, and then stored in a cotton cloth until Easter. I usually prepare it the day before, so that the flavors and the aromas blend better. I serve it as an antipasto in small slices. You can also serve it as main course, but then no other carbs should be in the meal! Happy Easter! Buona Pasqua my beloved readers. 1. Prepare the filling. In a nonstick saucepan, cook the wheat with milk for about an hour over medium-low heat, until the mixture resembles creamy oatmeal (if you like it very creamy and smooth, you can use an immersion blender after cooking. I prefer a grainy taste). Once ready, pour the mixture into a bowl and let it cool. Once cooled, in a large bowl combine the cooked wheat with the ricotta, provolone cheese, salami, egg yolks and pepper to taste. 6. Bake for about 50-55 minutes, until set in the middle. Turn off the oven, open the oven door slightly and leave to cool. Once cool, remove the sides, cover with a clean cloth and let rest on a grid until. You can enjoy or let rest overnight.